"It seems that the genius of music is like a bird that flies about and is looking for a brain to nest in. The bird ended up in the head of a young Greek, Dimitris Sgouros"
"Dimitris Sgouros gives the impression of exceeding the normal human limits of piano technique... his interpretation has a charming magic, structural clarity, and is deeply philosophical yet always natural-sounding... opening up an exceptional path of appreciation and understanding of the music... his rhythmic impulse in the fast passages reminds us of Sergei Prokofiev himself! 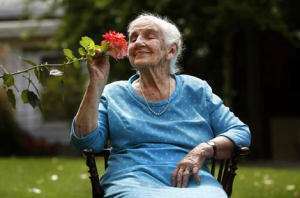 We hope to hear again this remarkable pianist." 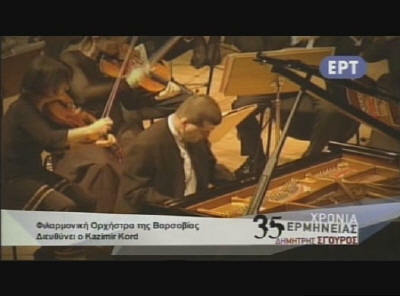 Pianist Dimitris Sgouros ( DHMHTRHS SGOUROS ) is one of today's most sought-after classical artists. As orchestral soloist, recitalist, and chamber musician, he has garnered an enviable reputation as a performer whose commanding virtuosity and impassioned music-making are bringing new life to the concert stage. His musical career has taken him to many of the world's most prestigious venues: London's Royal Festival Hall, Barbican Centre; New York's Carnegie Hall, Lincoln Center; Chicago's Orchestra Hall; Wolf Trap in Virginia; Ottawa's NAC Theatre; Salle Pleyel de Paris; Berlin's Philharmonic Hall and Konzerthaus; Rome's Campidoglio; Vienna's Musikverein and Konzerthaus; Amsterdam's Concertgebouw; Warsaw's Philharmonic Hall; Great Hall of Moscow Conservatory; Prince's Palace of Monaco; Madrid's Teatro Real; Barcelona's Palau de la Música Catalana ; Tokyo's Suntory Hall; Athens' Odeon of Herodes Atticus; Australia's Sydney Opera House, Melbourne Concert Hall; Singapore's Indoor Stadium. 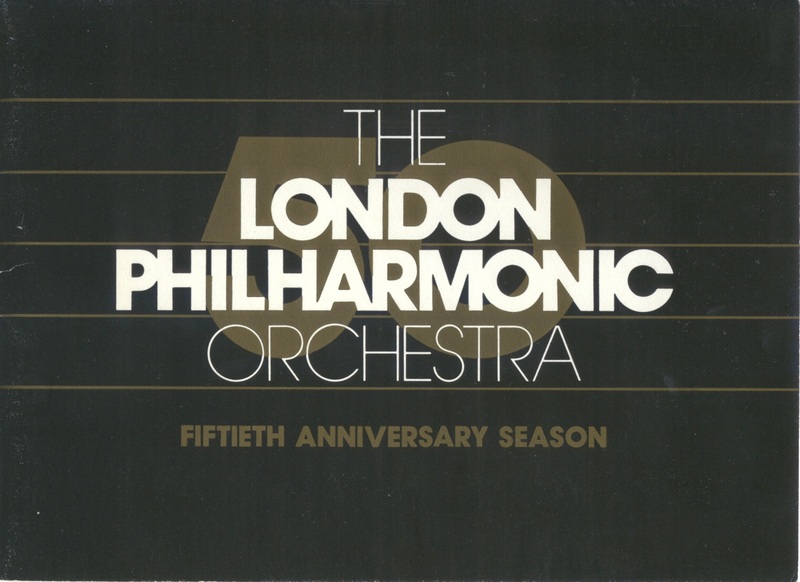 He has collaborated with some of the world's best-known conductors and orchestras, including the Berlin Philharmonic, London Philharmonic, London Symphony, BBC Symphony, English Chamber Orchestra, City of Oxford Orchestra, Vienna Symphony, Budapest Festival Orchestra, Orchestre National de France, Beijing Symphony, NHK Radio Symphony Orchestra, Leipzig Gewandhaus Orchestra, Dresden Philharmonic, St Petersburg Philharmonic, Bolshoi Theatre Orchestra, USSR State Symphony Orchestra, USSR Festival Orchestra, Salzburger Kammerphilharmonie, Suisse Romande Orchestra, Zurich Chamber Orchestra, Sinfonia Varsovia, Warsaw Philharmonic, Orchestra dell'Accademia Nazionale di Santa Cecilia, Monte-Carlo Philharmonic, Orchestre de Bordeaux Aquitaine, Czech Philharmonic, European Union Youth Orchestra, Israel Chamber Orchestra, Royal Oman Symphony Orchestra, National Symphony Orchestra of Washington, Dallas & Fort Worth Symphonies, Manhattan Philharmonic and American Symphony of New York, Cleveland Orchestra, Icelandic Symphony, Royal Danish Orchestra, National Orchestra of Spain, Sydney Symphony, Melbourne Symphony, Auckland Philharmonic and many others. Frequent international tours have led him to the U.S.A., Canada, Russia, Egypt, Oman, Japan, Australia, New Zealand, Hong Kong, Singapore, South Korea, Venezuela, South Africa, and to virtually every European country. Dimitris Sgouros is a perennial favourite of festival audiences, appearing at Newport (Rhode Island), Ravinia, Maryland, Blossom (Cleveland), Palm Beach, Harrogate, Lucerne, Lugano, Ravenna, Schwetzingen, Ruhr Piano Festival, Freiburg Zelt Music Festival, Munich Piano Summer, Prague Spring, Budapest Spring, Menton, Radio France, Festival de Musique en Mer, Canary Islands Music Festival, Melbourne, and many others. He is a frequent chamber music collaborator with some of today's most distinguished artists, including violinists Shlomo Mintz, Salvatore Accardo, Leonidas Kavakos, Christos Galileas; the cellists Mischa Maisky, Nikolas Kavakos; and pre-eminent ensembles such as the Borodin Quartet, Kodaly Quartet, Sharon Quartet, Komitas Quartet, Salzburg Pro Arte Quartet, Vienna Artis Quartet, and Zagreb Soloists. His operatic soirees with the American soprano Chrissellene Petropoulos (a pupil of Maria Callas) were rapturously received. 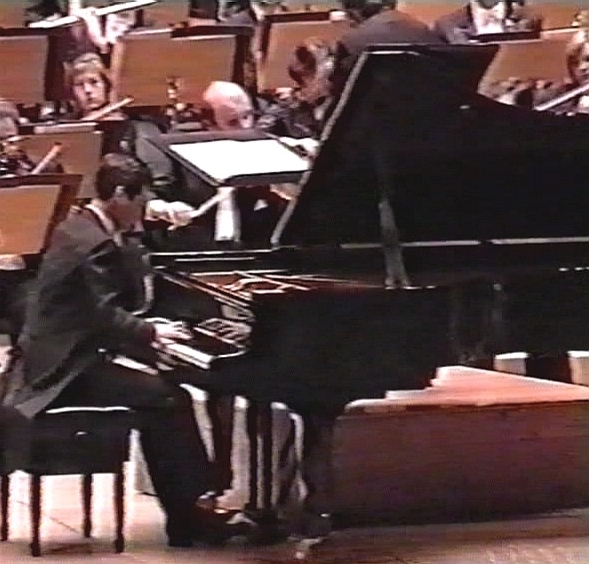 The late Erick Friedman (star protege of Jascha Heifetz) also found him to be a sympathetic accompanist, and together they concertized regularly. 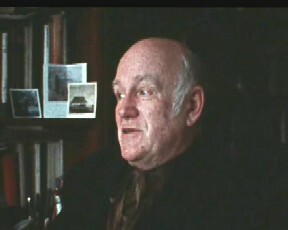 He maintains an active teaching schedule and has given seminars and masterclasses at Athens University, the Toho Gakuen School of Music in Japan, the Bilkent University of Ankara, the Southern Methodist University of Dallas, the New Conservatory in Thessaloniki, Greece, as well as the Bosville Conservatory in Switzerland. Since 1987 he has been funding the Sgouros Scholarship Award in the New Salonica Odeon. 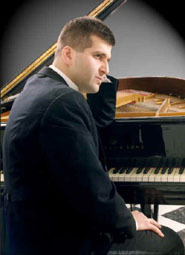 He has been a judge in well-known piano competitions, including the David Paul Landa Memorial Scholarship (Australia's richest award for pianists), where he served on the jury alongside Professor Warren Thomson (esteemed for his role as Chairman of the Jury of the Sydney International Piano Competition since its inception). Several events have been established in his honour, including Sgouros Festivals in cities as far apart as Ljubljana, Hamburg and Singapore. 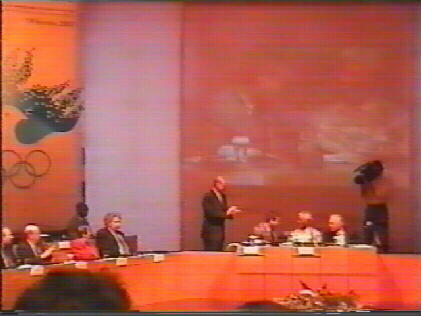 He has been honoured by the Mayor of Los Angeles (for his participation in the opening ceremony of the 1984 Olympic Games), as well as the Academy of Athens, and is a recipient of the Leonardo da Vinci Award and Melvin Jones Award, along with many other prestigious Greek and international honours. Dimitris Sgouros has been the subject of numerous feature stories around the globe in publications such as The New York Times, Time Magazine, Newsweek, Vogue, Reader's Digest, People Magazine, Andy Warhol's Interview, and London's Daily Mirror. He has also appeared on radio and television programs in many countries including the U.K., U.S.A., Japan, Australia, France, Germany, Hong Kong, Slovenia, Romania, The Netherlands, and was profiled by Oscar-winning director François Reichenbach in a feature-length documentary. 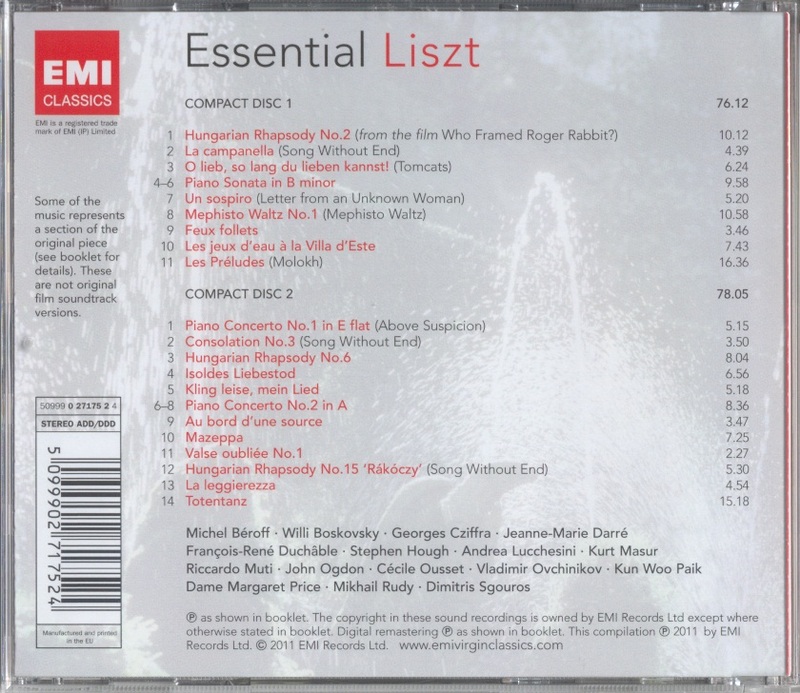 His chart-topping recordings for EMI have received widespread critical acclaim and include Rachmaninoff's 3rd Piano Concerto with the Berlin Philharmonic, Tchaikovsky's 1st Piano Concerto with the London Philharmonic, and two solo albums of Brahms, Schumann, and Liszt. 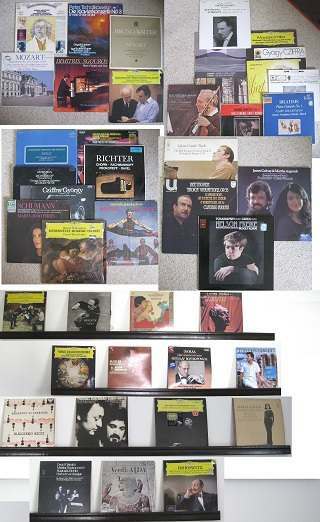 He has also recorded Liszt's 2nd Piano Concerto with the Slovenian Philharmonic; Rachmaninoff's 2nd and 3rd Piano Concertos with the Cyprus State Orchestra to mark Steinway & Sons' 150th anniversary; two live albums in Australia with works by Beethoven, Chopin, Schumann, and Liszt; the Brahms Piano Quintet with the Komitas Quartet; and an all-Mozart album, released to commemorate the 200th anniversary of the composer's death. 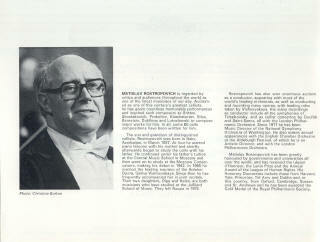 Harold C. Schonberg, longtime chief music critic of The New York Times, hailed his Capriccio recording of the Brahms Piano Concertos with the Sofia Philharmonic as a tour de force, lauding Sgouros for his "technical command, rich piano sound, strong rhythm, power, and musical authority", and concluding "... They don't come much better than this." Sgouros' latest CD album - produced by Grammy Award winner Adam Abeshouse for Elysium Recordings of New York - comprises two monumental works of the piano literature - Schumann's Fantasy Op 17 and Brahms Sonata Op 5 No 3. 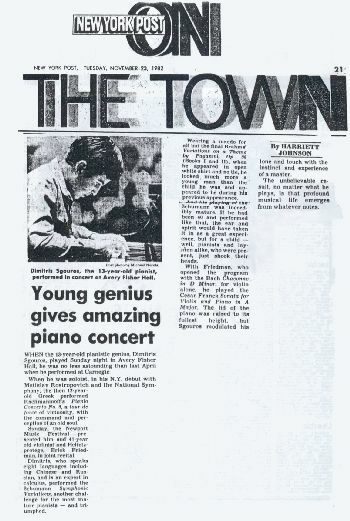 Of his performance of the Schumann, The New York Times said that "Mr Sgouros brought shimmering surface textures and misty harmonic colorations to the music." 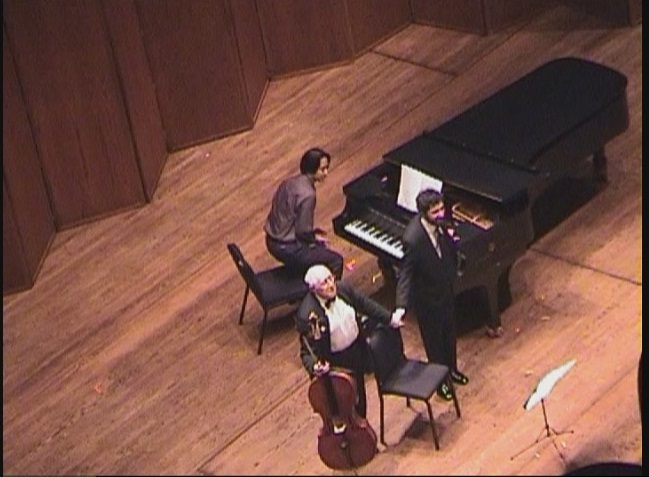 His reading of the Brahms Sonata had "flashes of youthful virtuosity and magisterial poise." 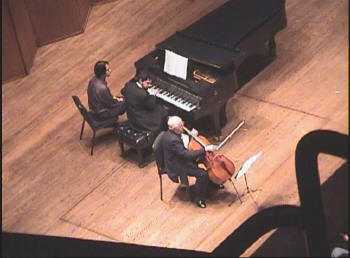 Harris Goldsmith of the American Record Guide concurred, praising Sgouros for his "admirably self-effacing" and "emotionally warm and communicative" approach to these masterpieces. His artistry has also been showcased in two DVD albums - an acclaimed solo recital from the 2000 Montpellier Festival in France (also aired on MEZZO TV), and a live concert recording of Beethoven's Emperor Concerto with the Bilkent Symphony Orchestra in April 2006. Dimitris Sgouros belongs to that select number of musicians who have successfully made the transition from child prodigy to mature artist. Poignancy, spontaneity, vitality, commanding virtuosity tempered with sensitivity, allied to an inspired and deeply probing musical intuition - these are the hallmarks of the alluring Greek Myth, a worthy heir to the Golden Age of Pianism. 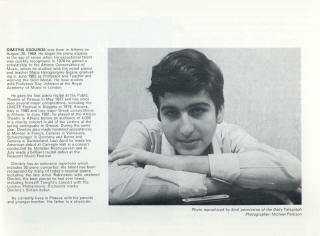 Dimitris Sgouros was born in Athens on August 30th, 1969, and began his piano studies at the age of six and a half. 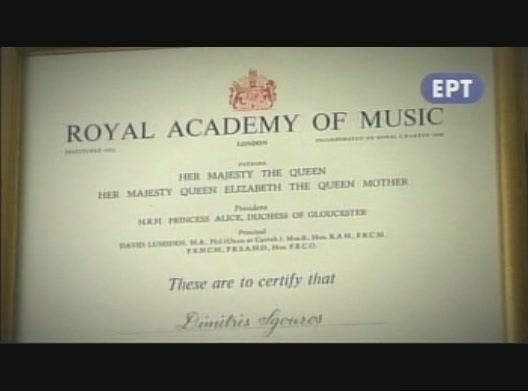 Within eighteen months he gained a scholarship to the Athens Conservatory of Music, where he studied with the noted pianist-teacher Maria Herogiorgiou-Sigara. 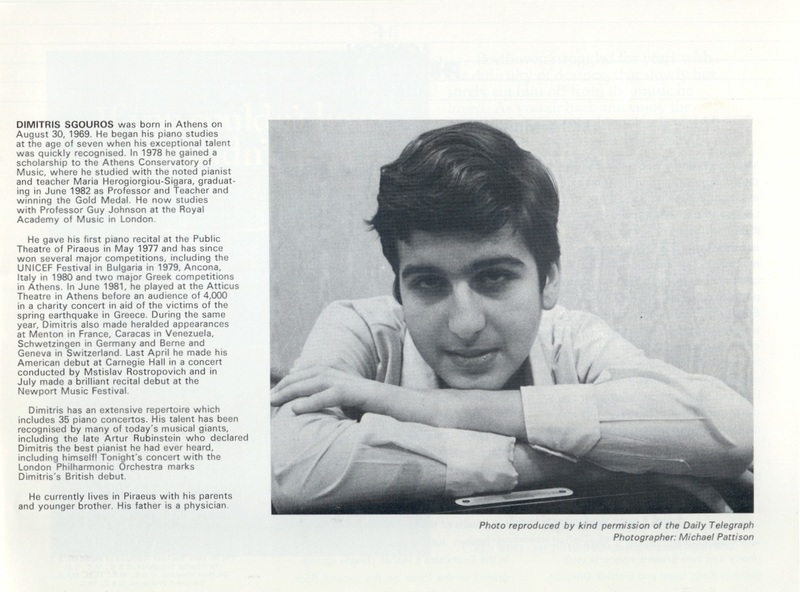 He gave his first piano recital in the Public Theatre of Piraeus in 1977 performing two of his own compositions, for which he also won two first prizes in the Composer's Competition in Sofia. He graduated from the Athens Conservatory in 1982 with a Professor's and Performer's Diploma, a First Prize and a Gold Medal. 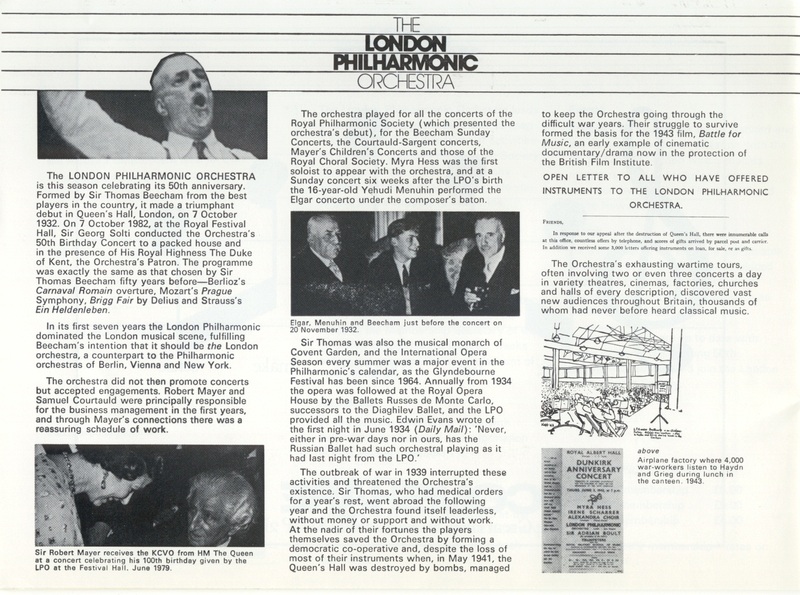 This was but one of several First Prizes he took at successive competitions between 1978 and 1983, among them the UNICEF Competition in Bulgaria in 1979 (where Leonard Bernstein was President of the Jury), the competition at Ancona, Italy, in 1980, and two major competitions in Athens. 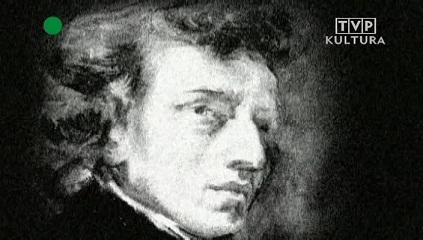 These early successes established him as the pianist of choice to perform with visiting artists in Greece. In 1981 he gave his first performance outside Greece in Bologna, Italy, followed by appearances and tours in France, Switzerland, Holland and Venezuela. 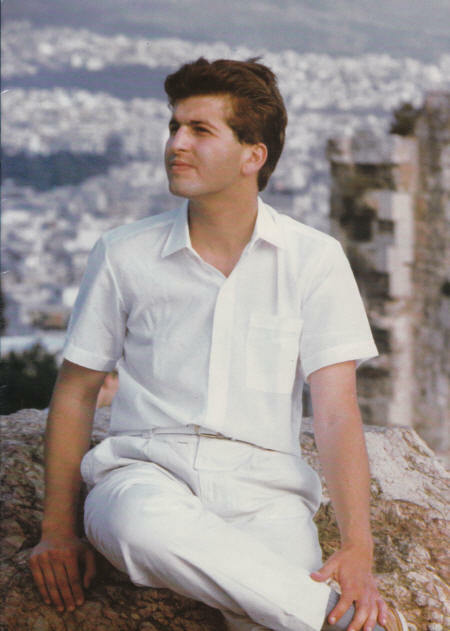 Sgouros began his orchestral career at the age of 11, performing a Mozart concerto with the Chamber Orchestra of Cannes under Philippe Bender. In the same year he performed in Germany with the Karlsruhe Chamber Orchestra in the palace where the seven-year-old Mozart had played. 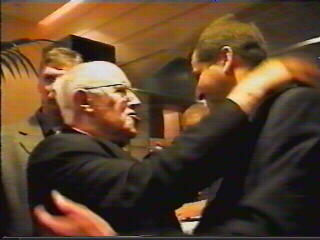 He substituted for Lazar Berman in Utrecht in February 1982 and for Mstislav Rostropovich in Munich that same year. In April 1982, his meteoric rise took him to Carnegie Hall in New York where he played one of the most demanding concertos in the piano repertoire, the 3rd of Rachmaninov with the National Symphony of Washington conducted by Rostropovich. This great Russian musician who has spoken of Sgouros as "a miracle - a creation from God" [read the interview] also conducted his London debut at the Royal Festival Hall with the same concerto in March 1983. 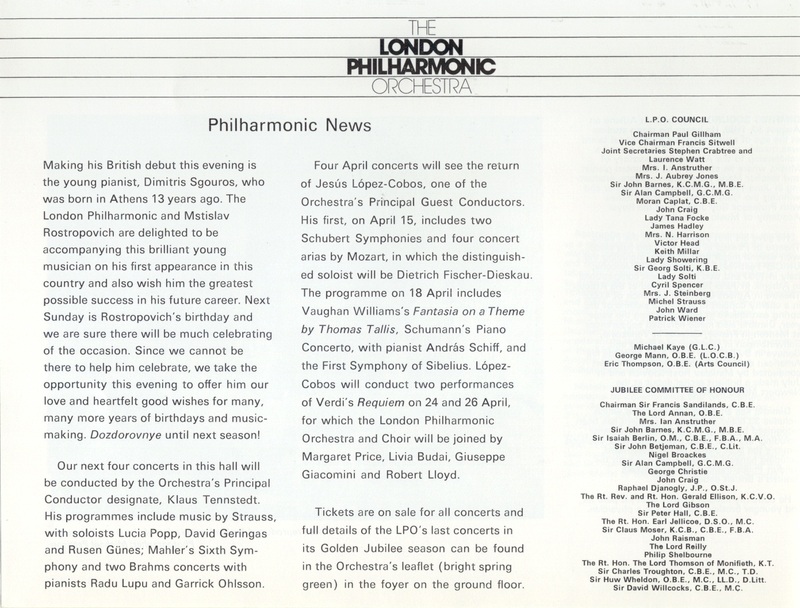 Later in that year Sgouros returned to the Royal Festival Hall for his U.K. recital debut, and to give the U.K. premiere of the Symphonic Piano Concerto by Greek composer Kalomiris. 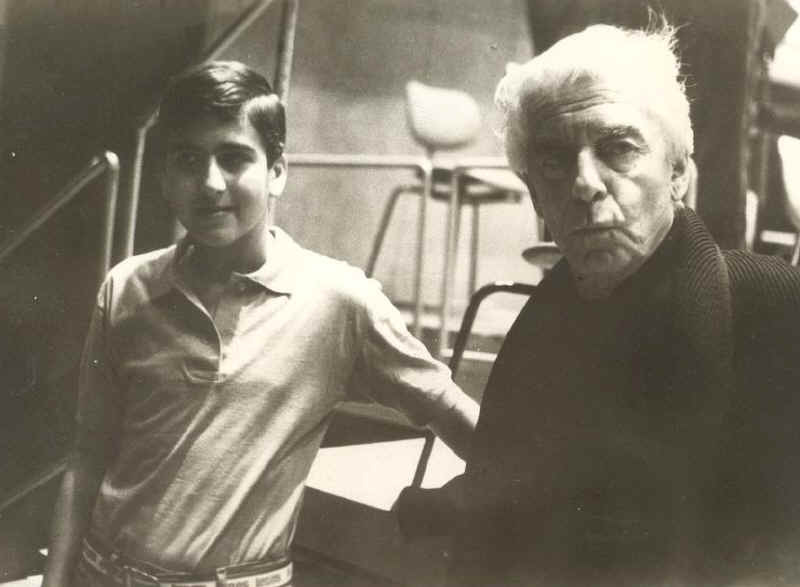 Sgouros was fortunate to have the opportunity to play for the great Artur Rubinstein just a few months before his death. Rubinstein was deeply affected by Sgouros' playing and declared him the best pianist he had ever heard, which was an extraordinary tribute. 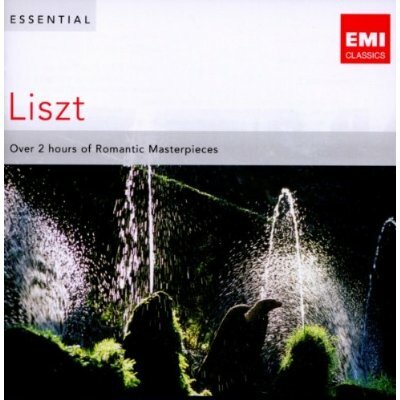 A classicist as well as a romantic, Sgouros gave a radiant and dignified account of Mozart's Piano Concerto No 20 with the London Symphony and Eduardo Mata in February 1984, in an historic double-billing with none other than Emil Gilels. Leon Fleisher conducted him in the very same concerto the following season. 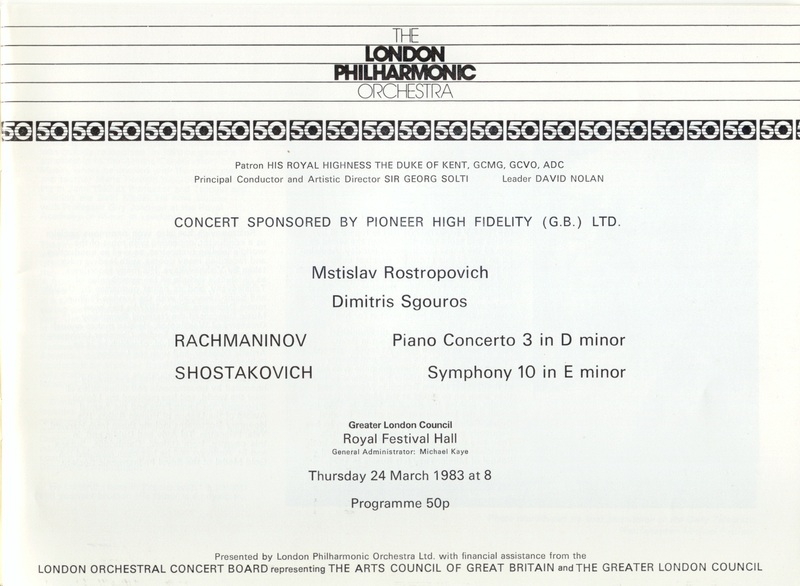 In April 1985, Sgouros captivated audiences in the Royal Festival Hall with his rendition of Tchaikovsky's 1st Piano Concerto, accompanied by the London Philharmonic under Jesus Lopez-Cobos. 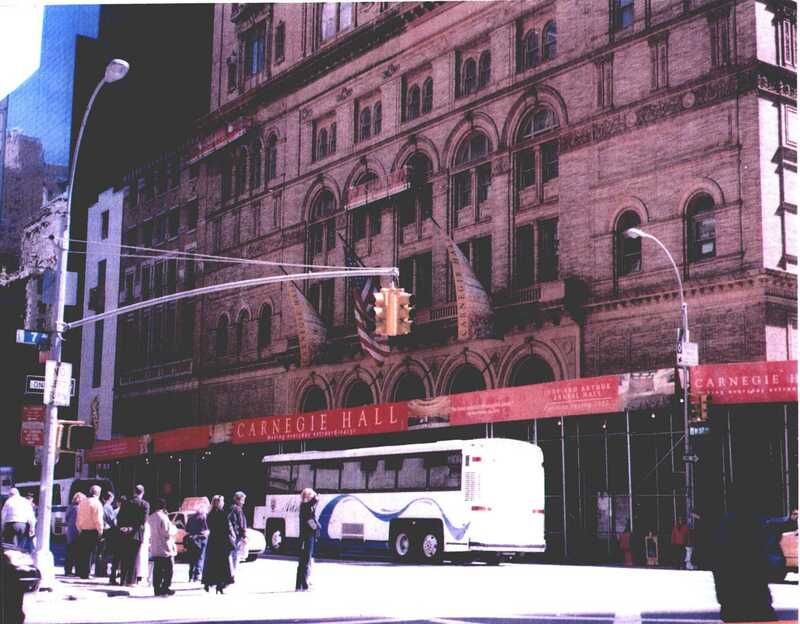 His sell-out performance of Chopin's 1st Piano Concerto in Carnegie Hall in April 1986 secured his reputation as an elegant yet fiery Chopinist. This was also one of the last concerts to be performed in the famed original acoustic of Carnegie Hall before controversial renovation works began in May 1986. At UNICEF's 40th Anniversary Gala Concert in The Hague, he shared the spotlight with Sir Peter Ustinov who dubbed him the "reincarnation of the Abbé Liszt" for his accompaniment of the Dutch Ballet. 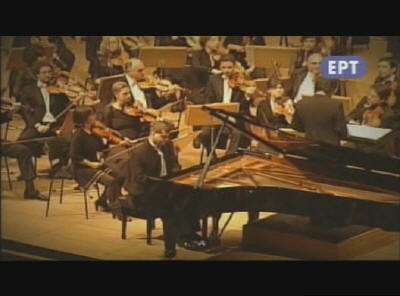 His concert in April 2009 with the BBC Symphony in Beethoven's epic 3rd Piano Concerto was featured on BBC Radio 3. While pursuing his career as a concert artist, Sgouros continued his musical studies, first at the University of Maryland under Stewart Gordon, and then at the Royal Academy of Music in London under Guy Jonson (a pupil of both Cortot and Rachmaninov) and Timothy Baxter, graduating with the highest mark ever awarded by that institution. And he kept up his compositional interests, writing brilliant cadenzas for several of Mozart's Piano Concertos, amongst others. A phenomenal memory allows Sgouros to choose his programmes from a repertoire of over 45 concertos and hundreds of solo and chamber-music works (including the complete piano music of Chopin, Liszt, Beethoven). 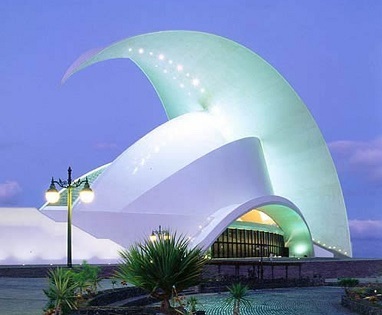 He has a passionate interest in opera and has in his memory the scores of all the great operas of Verdi and Puccini. He developed a scholarly fascination for period instruments and has become recognised as an accomplished harpsichordist. Apart from music, Sgouros has shown exceptional ability in his mathematics studies at Athens University and Oxford University (St Peter's College) and an outstanding gift for languages. As well as his native Greek he is fluent in English, Spanish, Portugese, Italian and German. His concert schedule has included tours of the U.S.A., Canada, Russia, Japan, Singapore, South Korea, Hong Kong, Australia, New Zealand, Venezuela, South Africa and virtually every country in Europe. He is a popular and familiar figure with German audiences, having toured repeatedly to major cities like Berlin, Frankfurt, Munich, Hamburg, as well as many smaller provincial towns. 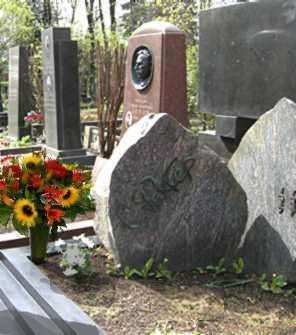 He has collaborated with all the major German orchestras, including the Berlin Philharmonic, with which he made his now-legendary recording of the Rachmaninoff 3rd Piano Concerto, when aged only 14. His Rachmaninoff 3rd was in such demand by Berlin audiences that he also played it twice with the Berlin Radio Symphony Orchestra under Jesús López Cobos (listeners of Germany's ARD-Nachtkonzert program syndicated on NDR / RBB / WDR3 / HR2 / Bayern 4 / SWR2 radio stations would have heard the second concert broadcast in December 2008). And he memorably performed the Brahms 2nd Piano Concerto and Tchaikovsky Concert Fantasy Op 56 with the Berlin Philharmonic under Herbert von Karajan and Mariss Jansons, respectively. 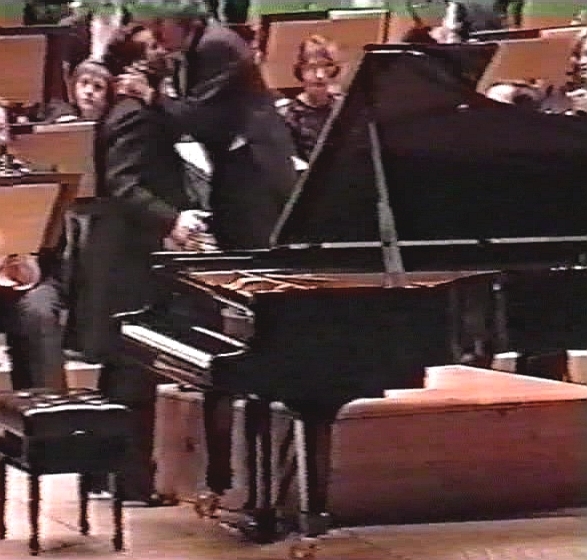 In the wake of Germany's historic reunification, Kurt Masur invited him to appear as soloist with the Leipzig Gewandhaus Orchestra in the Brahms 2nd Piano Concerto. 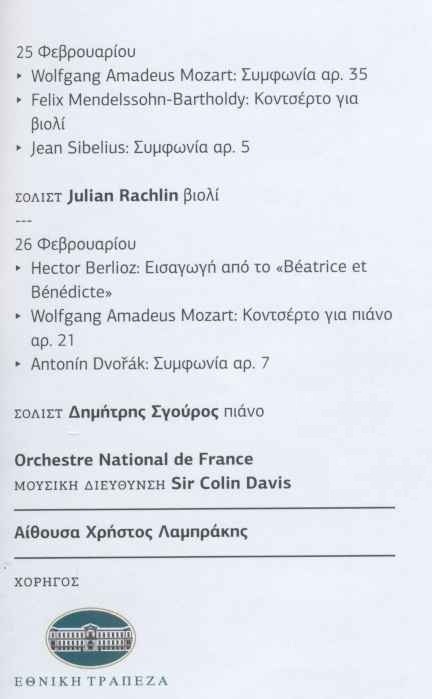 They gave three hugely successful concerts together, Sgouros proving yet again his strong affinity for the core Germanic repertoire. His partnership with Lorin Maazel and the Bavarian Radio Symphony Orchestra in Prokofiev's 3rd Piano Concerto was noteworthy for its intense musical rapport. And he was honoured to present the inaugural recital for the official opening of the ZDF studio in Mainz. Sir Charles Mackerras invited him to perform Beethoven's 4th Piano Concerto with the Czech Philharmonic Orchestra at the 1986 Prague Spring Festival (Smetana Hall), a concert seen around the country on Czechoslovak Television. He capped off his 1986 Prague Spring appearances with a solo recital before a spellbound audience at the Rudolfinum (Dvorak Hall). Dimitris Sgouros has made five extended tours of Australia and New Zealand. 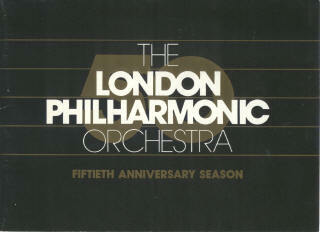 They were among the greatest triumphs ever seen in those countries with dozens of solo and orchestral concerts played to capacity audiences in all the major venues including Sydney Opera House, Melbourne Concert Hall, Brisbane Concert Hall, Adelaide Festival Theatre, Perth Concert Hall, Darwin Performing Arts Centre, Auckland Town Hall, Aotea Centre, Wellington Michael Fowler Centre, Christchurch Town Hall and Wanganui Opera House. Critics wrote countless columns of praise for Sgouros comparing his extraordinary technical ability with that of Liszt and Horowitz and delighting in his all-embracing musicianship which swept his audiences along with an intensity and excitement few performers of this or any other time have possessed. His ravishing, deeply personal readings of the Rachmaninov 2nd Concerto in Sydney Opera House (with the USSR State Symphony Orchestra and Yevgeni Svetlanov), and Rachmaninov 3rd and Brahms 2nd Concertos in Melbourne Concert Hall (under celebrated Russian maestro Vladimir Verbitsky) were widely seen as national simulcast on ABC TV/FM. 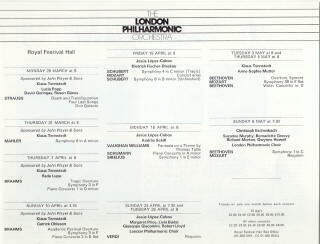 A particular favourite of Asian audiences, Sgouros has given concerts in Japan, South Korea, Hong Kong, and Singapore. His three tours of Japan - in 1984, 1986, and 1993 - took in the major cities of Tokyo, Osaka, Kyoto, Nagoya, Yokohama and included solo recitals as well as orchestral performances with the Yomiuri Nippon Symphony, Tokyo Symphony, Tokyo Philharmonic, and the NHK Radio Symphony Orchestra. 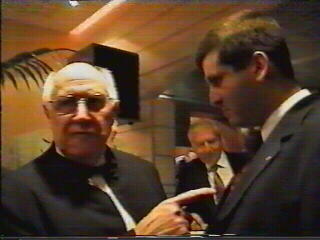 In Athens in September 1988 Dimitris Sgouros gave his first performance with Russia's greatest conductor and orchestra - Yevgeni Svetlanov and the USSR State Symphony Orchestra. 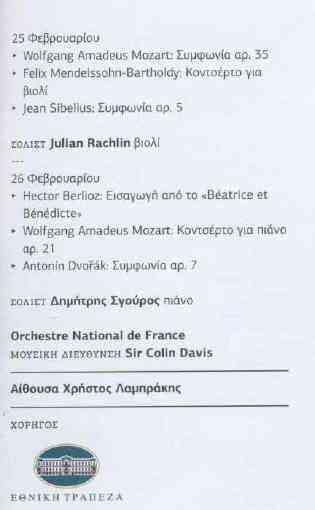 They performed together Rachmaninov's Second Piano Concerto to a capacity audience of 5000 in the Herodes Atticus Theatre which Sgouros has described as one of the greatest nights of his career. 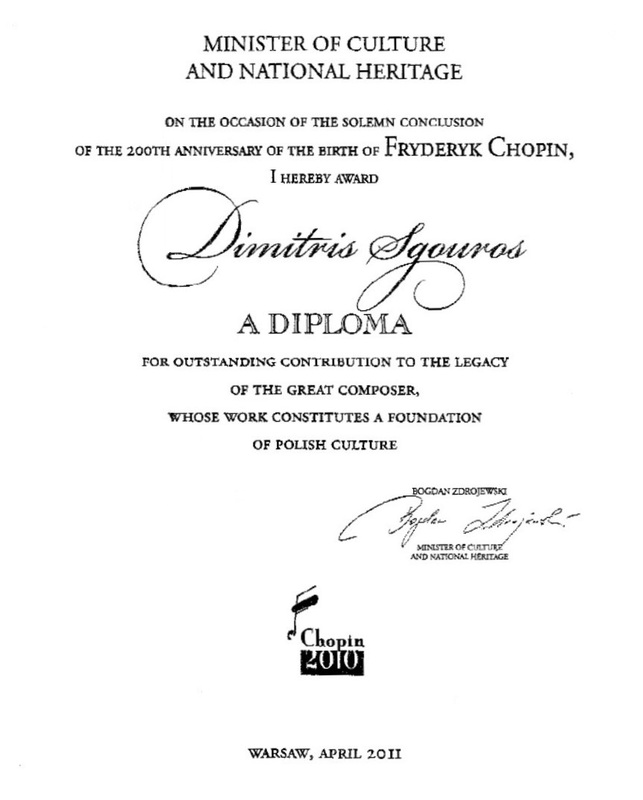 In May 1995, Sgouros performed in a gala recital at St James's Palace in London, attended by Their Majesties the King and Queen of Sweden, Constantine II (former King of Greece), HRH the Duke of Kent, and more than 300 other distinguished guests. 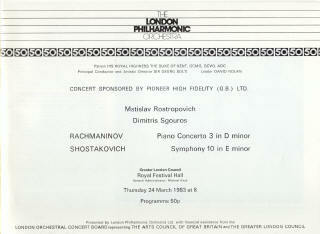 In 1997 he was invited by Russian President Boris Yeltsin to Moscow as part of the celebrations marking the 850th anniversary of the founding of the city, performing Rachmaninov's Third Piano Concerto with the Russian State Philharmonic Capella under the baton of Valeri Polyansky, a concert heard throughout Russia on the popular Radio Orpheus station. Sgouros also paid a memorable visit to Tchaikovsky Memorial House in Klin, Russia, performing on Tchaikovsky's own piano. He returned to Moscow in October 2005, joining forces with the Bolshoi Theatre Orchestra at the Kremlin to mark the 200th anniversary of the founding of the Moscow Kremlin Museum. In March 1999, Sgouros undertook his first tour of South Africa, giving solo recitals as well as orchestral performances with the National Symphony Orchestra of Johannesburg in the major centres of Cape Town, Durban, Pretoria and Johannesburg. 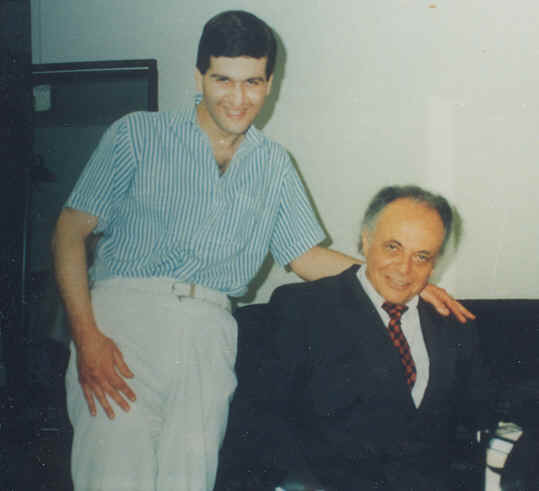 To mark the 50th anniversary of Israel's founding, he joyfully accepted an invitation to present Beethoven's 3rd Piano Concerto with the Israel Chamber Orchestra under leading Spanish maestro Salvador Mas Conde (following on from previous collaborations with this conductor in Spain, Germany and Maastricht). 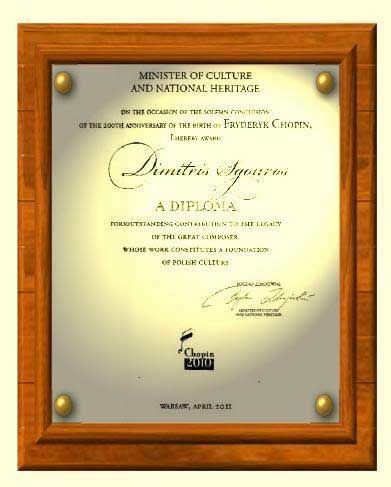 In April 2000, Dimitris Sgouros appeared as solo recitalist in Carnegie Hall, performing masterpieces by Schubert, Schumann and Brahms. The New York Times said that his playing displayed "flashes of youthful virtuosity and magisterial poise." The American Record Guide went further, saying he "played with irresistible elegance and whimsy"; "emotional warmth"; and praising the "admirable structural clarity" of his interpretations. 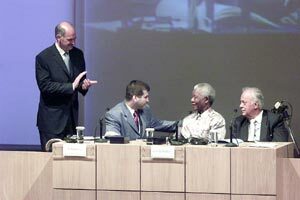 The enthusiastic reception that greeted his historic return to Turkey in 2001 and 2002, recalled the momentous successes of his first appearances in that country in 1989 and 1990. 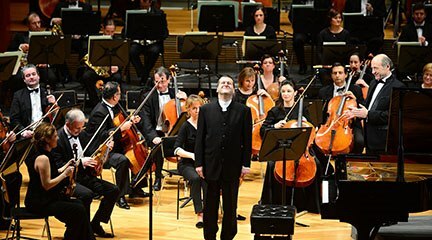 Capacity audiences in Ankara and Istanbul were treated to solo recitals as well as orchestral performances with the Borusan Philharmonic under distinguished conductors Gürer Aykal and Emil Tabakov. 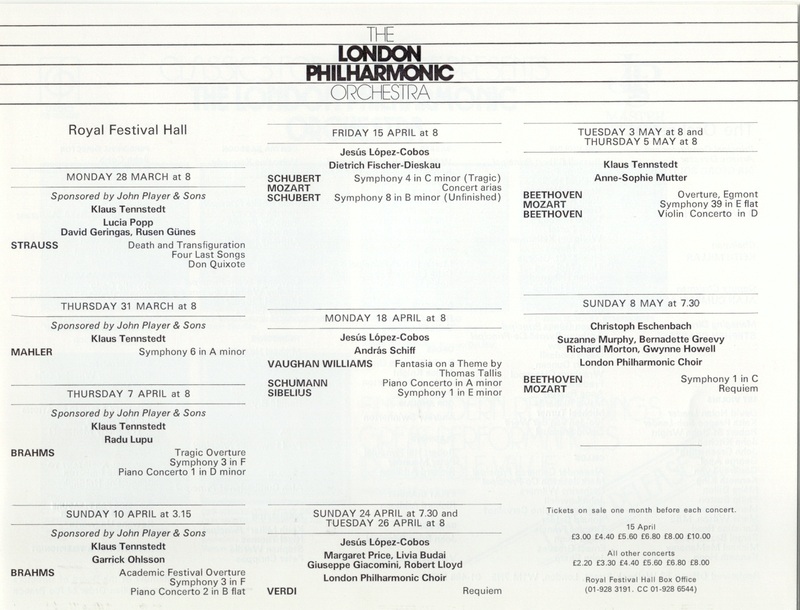 Other recent highlights of his concert diary include guest appearances at the 2000 Montpellier Festival in France (aired on MEZZO TV), and the 2001 Spring Festivals in Athens, Bucharest, and Budapest. 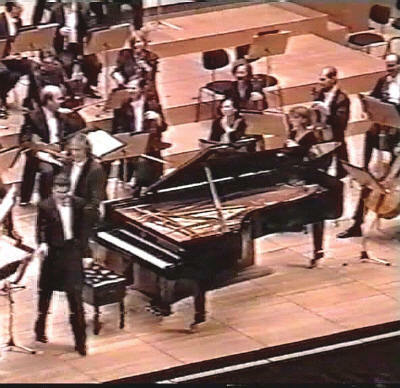 In 2003 he performed Tchaikovsky's 1st Piano Concerto with the Orchestre Philharmonique de Radio France under Myung-Whun Chung. 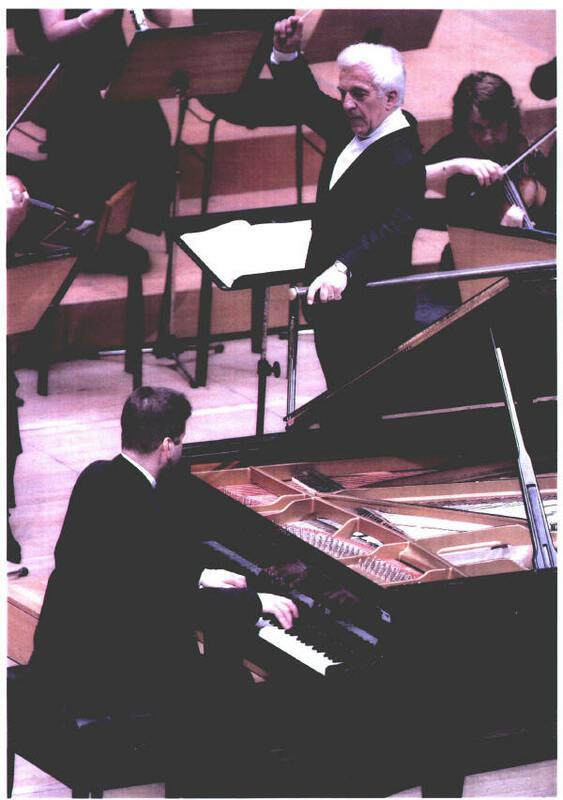 In 2004 he appeared as soloist in Rachmaninoff's 2nd Piano Concerto with the London Philharmonia under Vladimir Ashkenazy. And in 2007, he played Liszt's 2nd Piano Concerto with the Budapest Festival Orchestra under Ivan Fischer, and Chopin's 1st Piano Concerto with the Menton Festival Orchestra led by Jean Bernard Pommier. His artistic collaboration with Yuri Temirkanov and the St Petersburg Philharmonic was gratefully acknowledged by UNESCO's Goodwill Ambassadors, during their 2007 convocation in Paris. 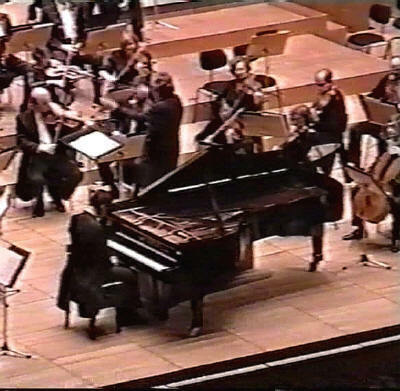 In November 2007, he joined a star-studded lineup in Beijing for the 2008 Beijing Olympic cultural celebrations, performing Rachmaninoff's 3rd Piano Concerto with the Beijing Symphony Orchestra under Tan Lihua. 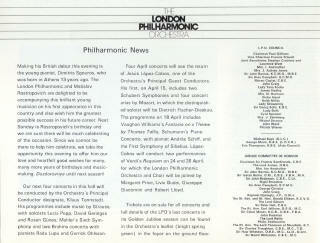 He presented an invitation-only recital at the Purcell Room of the Queen Elizabeth Hall in London's Southbank Centre in November 2008. During the 2009 season he traversed Beethoven's 3rd Piano Concerto with the BBC Symphony Orchestra of London directed by Jiri Belohlavek. In 2010, Sgouros made his debut appearance with the Kiev Philharmonic Orchestra in the Ukraine, and took centre stage in Ivan Fischer's Beethoven Marathon Festival in Budapest. 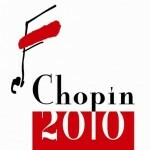 As one of the foremost interpreters of Chopin, his appointment to the celebrations committee of Chopin 2010 comes as little surprise (the year 2010 having been officially declared Fryderyk Chopin Year by the Polish Parliament). 2011 witnessed his return to the gilded mansions of the Newport Music Festival in Rhode Island, with a Gala opening recital dedicated to the treasured memory of late Newport Music Festival Director Dr Mark P. Malkovich III. 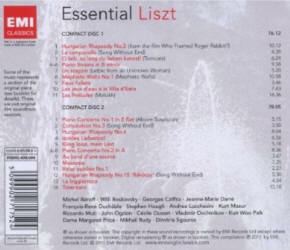 In homage of the 200th anniversary of Franz Liszt in 2011, Warner/EMI Classics has issued a new double-CD set entitled "Essential Liszt" with landmark recordings by Dimitris Sgouros and other featured Liszt exponents of the modern era. 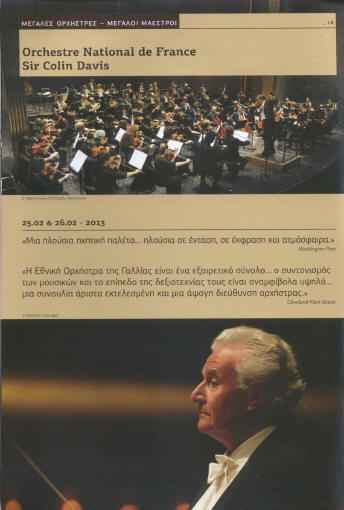 In 2012, he opened the Festival of the Aegean in Greece and inaugurated the 2012/2013 seasons of the Mannheim Philharmonic and Qatar Philharmonic Orchestras. He ushered in 2013 with Orchestre National de France in Mozart's Piano Concerto No 21, and embarked on a major tour of Italy with the Budapest Festival Orchestra and Ivan Fischer in May 2013. A wider European tour with the Budapest Festival Orchestra embracing The Netherlands, Spain, Turkey, Greece and Hungary is confirmed for the 2015/16 season. In recognition of his distinctive achievements, UNESCO conferred upon him their Prize for Arts, Sciences and Literature in May 2014. Celebrating 200 Years Franz Liszt "... he maintained his pianistic composure with an astonishing degree of control throughout a program that would have tested the mettle of a Horowitz or Serkin.... it is difficult to imagine anyone, Liszt included, capturing the wild diablerie - also the vulgarity - of the Mephisto Waltz with greater panache..."
"Unquestionably a Lisztian of the highest level and ability" - "Ein Liszt-Spieler von hohem Rang und absoluter Kompetenz ist er ohne Frage"
"As for the (Liszt) Norma transcription, the work is usually played to show a pianist's skill. Sgouros didn't need that. His skill was so extraordinary that he could play it actually as opera... such is his genius, so sensitive his virtuosity, that a single recital hardly begins to plumb that limitless artistry." "Many a time have I found myself a prisoner to my own talent, but all those things that were happening to me were so beautiful, and nothing appealed to me more than music and devoting myself to it. My leisure has been all about learning the great works of classical music, and my spare time has been all about expanding the intellectual and technical knowledge that surrounded these great works." 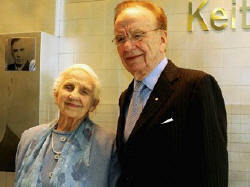 Melbourne's new state-of-the-art Elisabeth Murdoch Hall is inspired by the design of Vienna's legendary Musikvereinsaal. 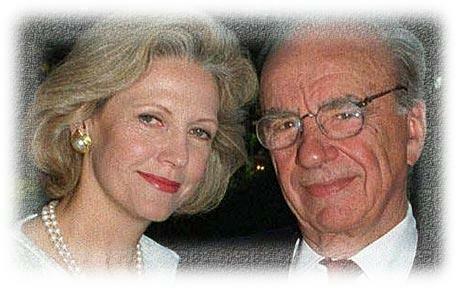 Named in honour of Dame Elisabeth Murdoch AC DBE, in recognition of her patronage, and to pay homage to her passion for music and for nurturing the finest young artists. Sgouros is a passionate fan of opera - for him the human voice is the ultimate muse. He also finds time for great instrumentalists past and present.